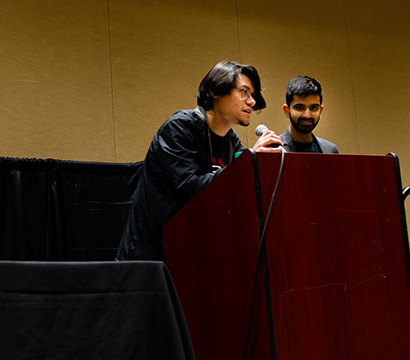 Gustavo Cervantes is a first-generation American with a dream of pursuing a career in the video game industry. Since senior year of high school, I knew that I wanted to study public relations. 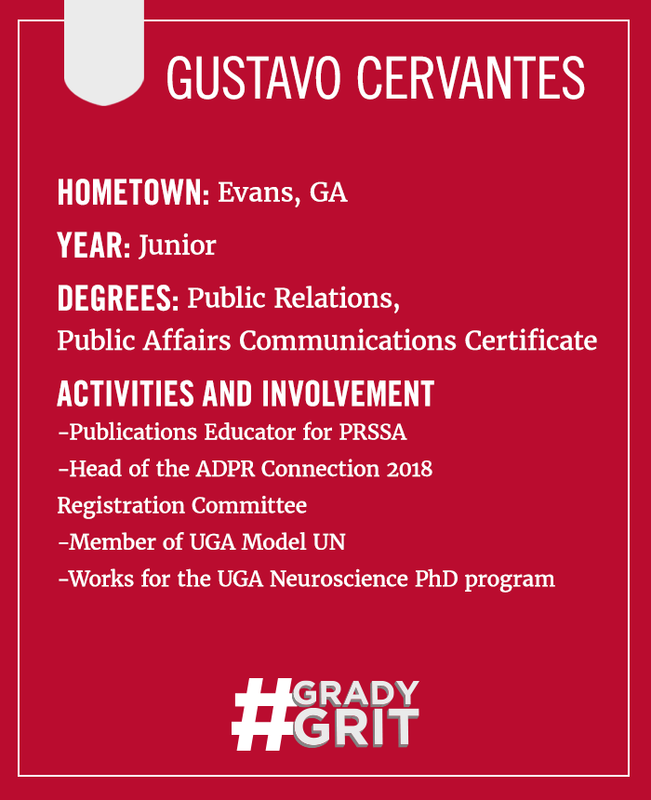 I also wanted to stay in-state, and when weighing the options for PR programs in this state, studying at Grady was the obvious choice after doing a little bit of research. I did debate between getting a smaller-school atmosphere at GCSU, but when I thought about what would be more beneficial to my career in the long-term, I knew that I had to pick Grady. How do you feel Grady celebrates diversity? I remember my freshman year of college I met this guy at my church who I found out was a senior advertising major. His family background was really similar to my own, and I remember paying extra attention to this because I had never really had a professional/peer role model that looked like I did. He reached out often to me and I later found myself wishing I had talked to him more. Anyway, I won’t forget when I found out that he was going to be the convocation speaker for the 2017 Grady graduation. It was honestly big for me, picturing him up there, a guy who really made it despite being a first-generation American like me. At that point as a freshman, it renewed my excitement and determination to get into Grady. What is your dream job after graduating from Grady? My dream job after graduating from Grady would be working with the Entertainment Software Association in Washington DC. Working for this interest group would perfectly combine my Grady training and my interest/passion for the video games industry. What has it been like to take on a leadership role in PRSSA? Leadership for PRSSA has been very rewarding. It certainly has come with its trials and tribulations but getting to know my peers in public relations on a more personal level is always a joy. Being on the publications committee specifically, I am always floored by the amount of talent that my committee members display in the articles they put together for our newsletter every month. How did you get started in Model UN? In high school I always loved to do speech and debate competitions, and I started the Model UN club at my school in my senior year. Once I got to UGA, applying to be on the Model UN team was a no-brainer for me. I felt really lucky to get in as a freshman because of how intense the application and interview process is. Having done the club for three years now, it has definitely been the defining experience of my college career up until now. The UGA Model UN team is filled with some of the most motivated, talented and brightest people I have ever met, and I have been lucky to get to learn how to refine my speechmaking and debating skills alongside them. It has been my constant up until this point in my college career, and I will always be grateful for the experiences it has afforded me. Cervantes’ participation in Model UN has been a constant in his college career while refining his speaking skills. 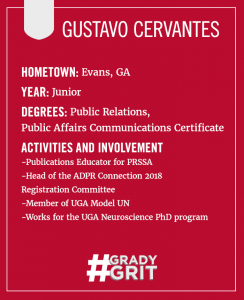 How do you use your Grady skills working with the UGA Neuroscience Program? What have you learned from doing it? I actually got into my current job at the UGA Neuroscience Program before I was admitted into the public relations major. There was a for-sure a huge difference in the quality of my communications work for the Neuroscience Program before and after I started taking classes in Grady. Being in Grady has really elevated my value at my job – my superiors really respect what I have to say about our communication strategy, and thanks to that I get a lot of agency in what I do for the program. I would say that winning second place in my Model UN committee at NYU’s collegiate competition. It was my first time winning an award at a Model UN competition, and I know it’s kind of lame to say it, but I beat out this person from Harvard in my room. At the beginning of the weekend I wasn’t sure I had it in me. Do you have a go-to restaurant in Athens? My go-to restaurant in Athens is Tlaloc. On the surface they are a Mexican place with great prices and great food, but they also serve a lot of the Salvadoran cuisine that I grew up with, so going there always feels like getting a little taste of home. Right now, I’m still on the hunt for internships! I hope to stay in Athens again for the summer. My favorite video game is an indie classic from 2004 called Cave Story. It holds a special place in my heart because it came into my life at just the right time – I’ve been playing it again recently and it holds up really well!